Description: This ATDNM program will introduce the idea of conceptualizing culture as “cultural spaces” and exploring how to negotiate these spaces in a global workplace. We will reflect on our own cultural programming and how it influences our ability to negotiate cultural spaces. The program will conclude by proposing “cultural humility” as a strategy for negotiating cultural nuances in global teamwork and cross-cultural interactions. 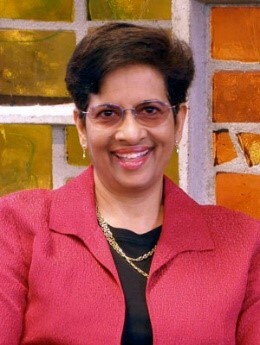 Bio: Charlotte Nirmalani “Lani” Gunawardena is Distinguished Professor of distance education and instructional technology in the Organization, Information, and Learning Sciences (OILS) Program at the University of New Mexico. She currently teaches graduate level courses in eLearning design, culture and global eLearning, cross-cultural issues in adult learning, research in distance education, and advanced program evaluation. Her publication record in distance and online education spans over 30 years with over 100 publications to her credit. She currently researches the sociocultural context of online learning communities, cultural issues in adult learning and the workplace, distributed co-mentoring, and interaction analysis as a method for assessing the social construction of knowledge online. Lani co-edited the book, Culture and Online Learning: Global Perspectives and Research and will be publishing a new co-authored book; Culturally Inclusive Instructional Design: A Framework and Guide to Building Online Wisdom Communities. Lani has directed evaluations for the U.S. Department of Education and the National Institutes of Health funded Native American Research Center for Health. She has conducted research as a Fulbright Regional Research Scholar in Morocco and her native country Sri Lanka, and consulted for the World Bank, the Asian Development Bank, U.S. corporations, and international higher education institutions in Brazil, Ghana, Mexico, Spain, Sri Lanka, and Turkey.